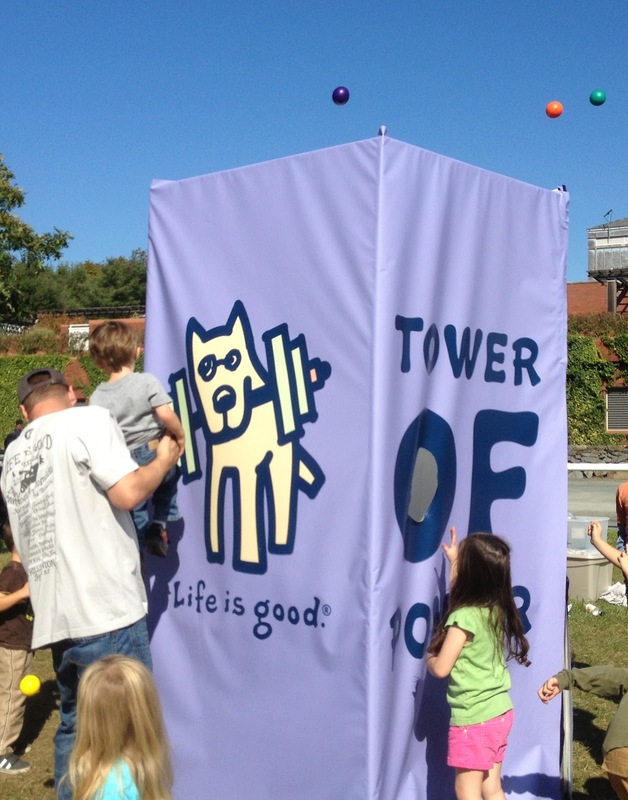 Emily and I had the chance to attend the 2012 life is good festival at Prowse Farm in Canton. We were supposed to attend it for both days, but unfortunately due to illness, we were only able to attend day one. Let me start off by saying that our history with the life is good folks goes back quite a few years. I have been volunteering with them since the Backyard Festival in June of 2005. My friend was competing for the title of World's greatest backyard athlete and I decided to help out wherever they needed it. That experience led me to help out the following year on the Boston Common for their Watermelon festival and Pumpkin festivals. In 2007, we were pumped to help out as the festival moved to Fenway park! We helped out with the sports activities and had a really great time - it was such a unique venue! 2008 saw the festival return to the Boston Common where they had us lead the PB&J team where we made a bunch of PB&J sandwiches that were sold and all proceeds went to Project Joy (which would later become the life is good foundation). The Arts & Crafts crew in 2009 and the amazing volunteers! Photo credit: Life is good. Used with permission. 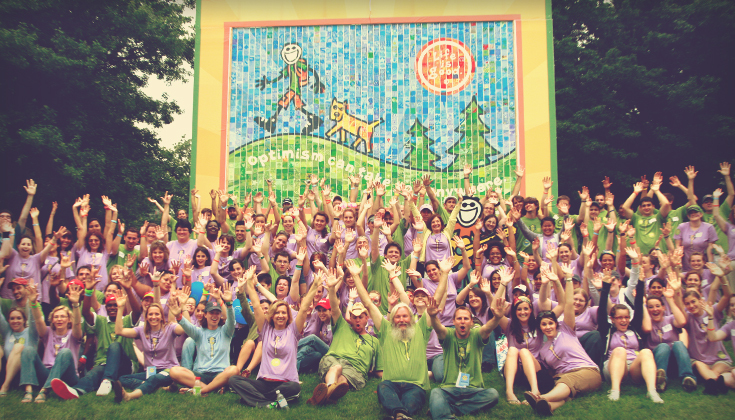 In 2009 back at the Common, we were team leaders of the Arts and Crafts tent where we didn't realize it, but our team would be helping to build the first of the Art for All murals which would become a signature achievement of each life is good festival! It was so great to see how the contributions of many people would make such a cool mural! Every year we go to the festival we see the mural and are reminded of the great group effort! 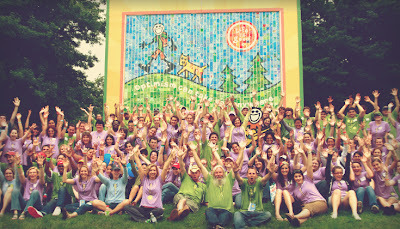 2010 we missed the festival for the first time because we were in the middle of searching for a house and Emily was pregnant and the festival moved to a two-day format and we just didn't think that we could devote the time needed as team leaders or volunteers for this wonderful two-day event. Instead we spread the word to our friends and family to try and attend! Last year, we had the pleasure of attending the festival as festival-goers and had such a blast we wanted to come back this year and cover it for our new blog! So, with that history all spelled out, here's our take on this year's amazing festival! We felt the same excitement walking into the festival as we have previous years. We were excited to visit new booths and check out ones we had visited in the past. Of course, the three different music stages were awesome. This year, we ended up spending the most time at the kids stage watching our little one and our friends' little ones dance around. It was a great atmosphere. No one minded if each other's kids stepped on one another's blanket or you had to run in front of someone to chase after your child. Everyone was warm, friendly and helpful. There were two great kids booths set up near the kid's stage. One was tegu pillows which was tons of fun for kids to jump, dive, lay, squish and swirl on enormous pillows. Kids and adults all got a kick out of it, and it did get very crowded. 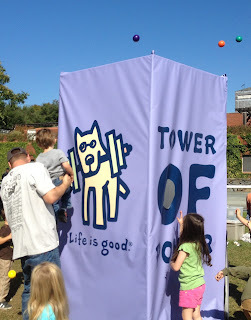 The other awesome kids game was the ball tower where kids threw plastic balls into a four sided tower with various holes. Once all of the balls were thrown in, a Life is good volunteer would dump them out on the kids. It was hilarious to watch and amazing to see how long they would chase after these balls. We got a great refreshing treat at the Stonyfield booth after we had all danced our pants off. Yogurt samples, fun kid games, and interactive activities kept us busy for a while. Then, we got to calm down over some hot chocolate thanks to the great folks at Keurig and Cafe Escapes! The Chillville zone was an awesome break from all of the happenings and a great spot to change some diapers and freshen up. The diaper area was well stocked with many sizes of diapers and wipes. Unfortunately there was always a line of babies needing to be changed. It was great to see that the life is good folks thought about this. It was so considerate and made things so much easier and family friendly. There was also a mom's nursing area, another kids stage and a larger than life lincoln logs building area. They also had a bunch of local trucks that kids could explore as well as a really handy Tag-a-Tot booth where you could register your kid in the unfortunate event that you get separated. Thankfully we didn't need to worry about that! Another great spot was the bright horizons arts and crafts booth where kids were able to paint on adorable recordable frames, create masks, bracelets, and butterfly clips. This area was totally kid friendly and child centered. Although, it was very had to maneuver. The tables were very close together and it was really hard to get from one area to another. It would have been great if it could have been more spread out. There were many booths to sample products and one of our favorite was the new Unreal candy booth where we got quite a few samples to take home and the candy is made from all-natural products. There was lots of great local food to eat while enjoying the amazing musical lineup. Thanks so much to the great folks at life is good for giving us the opportunity to enjoy a wonderful weekend with our family! DISCLOSURE: We received passes at no charge to the festival. There was no guarantee made that this would be a positive recap. All views are 100% our own.